This is a follow up to the wrappers made on this post. I have made these wrappers many times now and they still work. Last week I ran out strong white flour so I used plain flour, it wasn't as good the wrappers were easier to break. I can now confirm the stronger (higher protein contain) the flour the better. The other thing I also found out was they are not very good to wrap after in the fridge for few days, the wrappers become brittle and split easily. I will amend the wrapper making post saying they are good to keep in fridge. I will now show you a standard way to fill and wrap spring rolls. You can use any fillings you like. I find raw meat is so much easier to wrap than bits of loose filling. Do not use anything with very high water content, the rolls will split and spit during frying. Here is a standard recipe I do use frequently. 3 tbsp cornflour (corn starch), more cornflour is needed if the mixture is wet. Soak the wood ear till softened and expanded 3 - 4 times. Clean and finely shredded. Easier way to shred wood ear is too roll it up then shred. Now put all ingredients in a large bowl. Mix well. Best way is to use your hand, keep squeezing and mixing till all combined and the mixture is quite firm. If you don't like the touch of raw meat use gloves. Now make a flour and water paste for sealing the spring rolls. Use about 1 heap tbsp plain flour mix with water. The mixture should be runny. To deep fry the spring rolls, I normally use a wok which uses less oil. Or you can use an electric deep fat fryer. Heat the oil till hot before adding the spring rolls. If using wok need to keep turning the spring rolls till done. 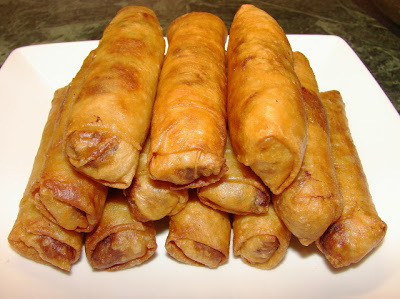 If you are frying a big batch or serving these rolls at a later time, after frying keep the rolls in single layer in the oven around 120 - 130deg C.
How to wrap spring rolls. See slide show. I have never tried to make spring rolls but I do love them. Hi Shayma, I am away from home right now. Will be back online and more recipes after the new year. Merry Christmas & Happy New Year 2010 to you & Family & Happy Holiday too!! Missed your posting - Happy New Year to you and your family.